This story has a surprise ending. Many people know that I’m a computer hacker. So I’m often asked to help out with various computer issues. Today, I helped Spangleyman set up a WordPress blog. From choosing a domain name to his first post took 3.5 hours. Including 30 minutes for lunch. (I took the day off from work.) That’s pretty quick for a newbie, and it would have been much quicker except for a few roadblocks along the way. First, we chose a domain name. Yesterday, I had asked Spangleyman to come up with ten good domain names. Today, we picked the best one. (Shorter is better than longer, avoid using others’ trademarks in your domain names, pick domains that are easy to spell, etc.) We registered the chosen domain name with GoDaddy. Third, we followed the five-minute WordPress install. This part took about two hours. We ran into a major problem with MySQL. We could not access MySQL from the command line, but the server was running (as evidenced by my other MySQL-poweerd blogs running fine). When we tried to administer MySQL from a GUI (the Webmin module), MySQL reported that it was not running. Other flakey behavior followed. So we ended up uninstalling and then reinstalling MySQL 4.1, which fixed everything. I walked Spangleyman through all of this step-by-step, and he did everything. It was a good learning experience. 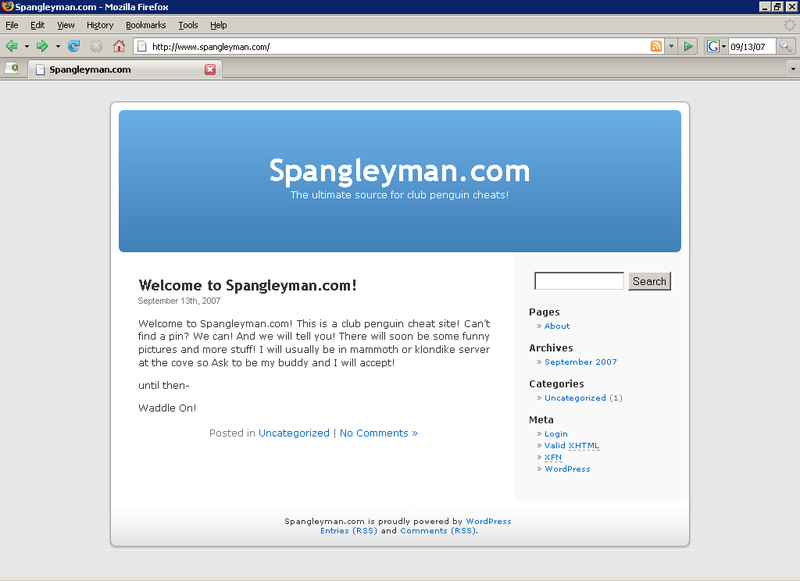 Fourth, we tweaked some WordPress options and Spangleyman created his first post. I did some of the driving (such as editing the “httpd.conf” Apache config file with Emacs), but Spangleyman did most of the driving while I navigated. He asked lots of good questions and learned a lot. I believe that the student will learn a lot more about computers if the student (not the teacher) operates the keyboard and mouse. Spangleyman is my son Ben. Ben is 11 years old and just started 6th grade. Today, I saw the future.